Reviews of the Pentax Optio P70 from around the web. Although it has recently astonished the world by announcing an impressive-looking 24x zoom bridge camera (which I hope to review very soon), Pentax is best known for its excellent digital SLRs and of course for its extensive and long-running series of ultra-compacts, the Optio range. The last one I looked at was the budget-priced 10MP, 5x zoom Optio M60 in December last year, but the digital camera market never rests, so today I'm taking a look at Pentax's latest, the 12MP, 4x zoom Optio P70. Those looking to step up from taking photos with their phone or other mobile device will want to consider the Pentax Optio P70, available for around £170. Fronted by a 28mm-equivalent wideangle lens with a 4x zoom, this 12-megapixel ultra-compact camera is point-and-shoot simple, with all the automatic comforts we expect, as well as some extras found above its price point. It looks great too, and is so thin and light that you may forget it's in your pocket. The P70 has plenty to offer for such a small camera -- just not speedy performance. 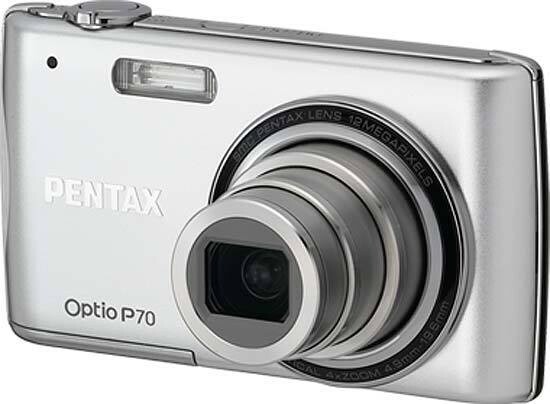 Pentax has recently released the Optio P70, an all new ultra-compact digicam which is the lightest and easiest to carry of all the Pentax models. Sporting a 12-Megapixel imaging sensor, 2.7-inch LCD screen, 4x wide optical zoom lens, HD movie capture and a handful of other creative features that assist you in capturing better photographs. Such features included Face Detection, Pixel Track Shake Reduction, Digital Shake Reduction, Smile Capture and Blink detection. In short, this camera has everything you could hope for in a compact digicam.